On the basis of the newly published report titled, 'Pasta Sauce Market: Global Industry Analysis and Opportunity Assessment 2018-2028', by Transparency Market Research, the overall revenue generated from the pasta sauce market is anticipated to be valued at somewhere around US$ 32 Bn in 2018, which is expected to rise at a CAGR of 6.5% throughout the forecast period (2018-2028). According to the data published by the Italian Association of Confectionery and Pasta Industries, Italy ranks first in the consumption and production of pasta. In the global pasta industry, Germany, France, U.K., U.S., and Japan consume 61% of Italian exports. 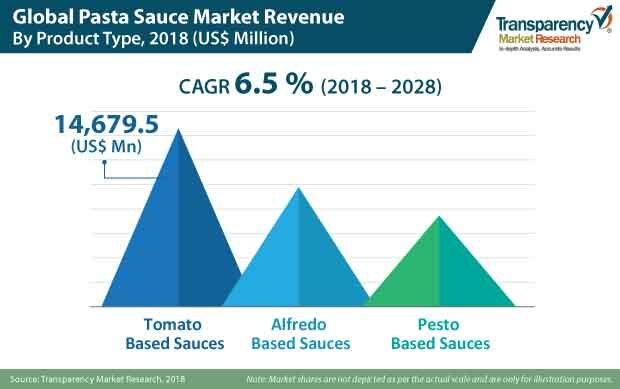 The pasta sauce market has registered remarkable growth over the last few decades, owing to increasing per capita consumption of pasta throughout the globe. The rising demand for pasta is directly fueling the demand for pasta sauce, which is used as one of the main ingredients in making pasta dishes. Westernization is increasing across regions, which makes pasta and pasta sauce one of the most loved Italian dishes. In the global pasta sauce market, Europe holds a prominent share in the production and consumption of pasta sauce. On the basis of our research, Asia Pacific is a booming market for the pasta sauce, owing to flavor inspiration and increasing per capita income, which enables the population to try palatable cuisines and dishes. Increased penetration of pasta sauce producers in developing economies has made the pasta sauce market more competitive with frequent and innovative product launches, more convenient delivery of products, and high quality certified products. Foodservice providers and food manufacturers are showing keen interest in bringing pasta sauce into their production lines, which is expected to drive the demand for pasta sauce in the coming future. The concept of 'premiumization' is influencing the pasta sauce market at large, extending beyond pricing, to include incredible quality and a superior experience. Premiumization has fueled consumer taste for value-added and high-quality products with good quality ingredients that promise enhanced health benefits. Consumers are willing to pay a premium price for products offering tangible health benefits – the only prerequisite being the promise of a unique offering that meets their basic health and dietary needs. In the global food and beverage market, customers are getting attracted towards lip-smacking food products. In addition, flavor inspiration is also influencing the food and beverage market, as people explore more of the world through the palatability of their cuisines. In the pasta sauce market, flavor inspiration is one of the major factors resulting in the booming demand for pasta sauce among customers. Pasta sauce is made with a variety of food ingredients that impart their taste, aroma, and texture to the pasta sauce. Due to the wide availability of a different range of flavors, pasta sauce is popping up in grocery store aisles as the most preferred go-to cooking sauce. TMR has profiled some of the prominent companies active in the pasta sauce market, such as Mizkan Co., Barilla S.p.A., Dolmio (Mars Inc.), Hunts (ConAgra Foods, Inc.), The H. J. Heinz Company, Newman Own Co., B&G Foods Holdings Corp., CSC Brand LP, Premier Foods plc., Lassonde Specialties Inc., Giovanni Food Company, Inc., Pellicano's Specialty Foods, Vino De Milo, Delgrosso Foods Inc., Nature’s Sun Grown Foods, Inc., Monterey Gourmet Foods, Dave’s Gourmet Inc., Nellino’s Sauce Co. and others. Increasing global presence and expansion of global players involved in pasta sauce processing are also having a deep impact on the increasing sales of pasta sauce around the world. Many companies are expanding by acquiring regional players, enhancing their product offerings, and pasta sauce processing facilities.